There’s no better way to demonstrate the experience you have solving business challenges than with a Customer Success Story from Juice Marketing. These full length stories are a great tool for demonstrating the value you add as a consultant and technology provider. 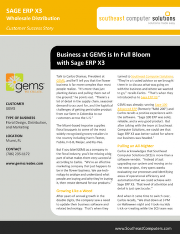 Southeast Computer Solutions – Sage ERP X3 success story for a customer in the floral industry that outgrew Sage 100 ERP and was ready to migrate. Oasis Solutions Group – Sage 100 ERP success story that tells the all too familiar story of a thriving company that quickly outgrew their entry-level accounting software. 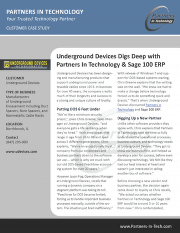 Partners in Technology – Sage 100 ERP success story about a manufacturer that was struggling with an outdated dos-based accounting system for over 20 years before turning to Partners in Technology. 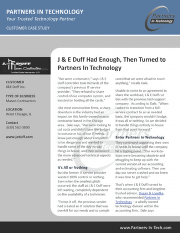 Partners in Technology – After J&E Duff turned to Partners in Technology for Managed IT Services and Support, Partners In Technology turned to Juice Marketing to tell the story of a successful partnership. Just like a Customer Success Story, but shorter – Juice Marketing’s Customer Buzz testimonials cut right to the good stuff in an easy-to-read one-page summary of your customers’ challenge, solution, and results. 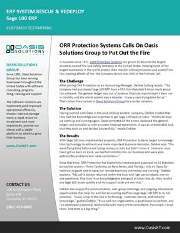 This Sage 100 ERP customer buzz tells the story of company that turned to Oasis Solutions Group to resurrect their system which was improperly implemented by a previous ERP consultant. 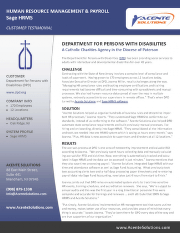 Sage HRMS customer buzz for Acente Solutions that tells the story of a nonprofit organization that was expanding so quickly that HR compliance and administration was becoming too difficult to manage manually. 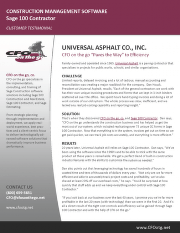 CFO on the Go – After successfully implementing Sage 100 Contractor for Universal Asphalt, a paving contractor, CFO on the Go wanted to highlight the customer’s story with a Customer Buzz testimonial. Along with our popular Sage ERP Newsletter program, Juice Marketing also offers Email Nurture Newsletters for clients that are looking to keep in touch with prospects. 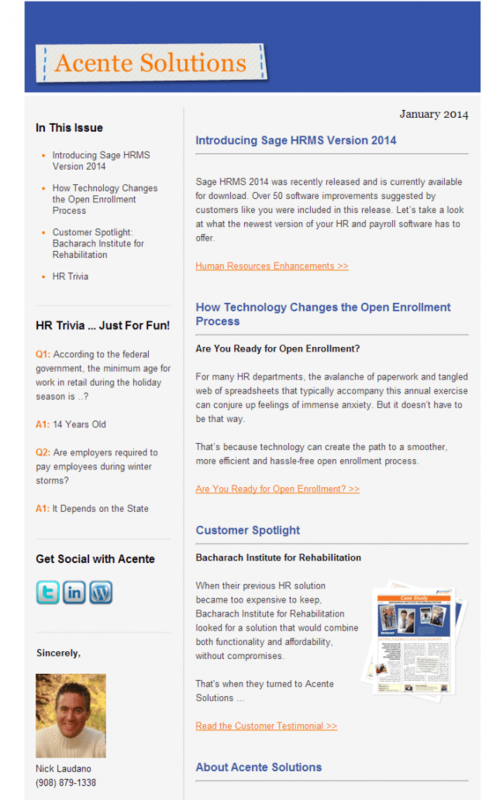 These email newsletters are expertly designed and have proven to be a great marketing tool. 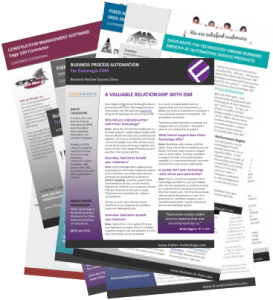 Equation Technologies – Sage 300 ERP partner that relies on Juice Marketing for monthly nurture newsletters to keep in touch with leads and prospects. Each nurture newsletter we develop drives traffic to the Equation Technologies blog and nurtures the leads in their pipeline. Acente Solutions – This Sage HRMS provider keeps in touch with prospects with the monthly AcenteWire Newsletter developed by the team at Juice Marketing. 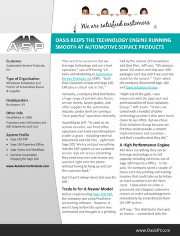 Sage Partners have been busy making with new products, trade shows, and business growth. When your company has a piece of juicy news to share, get it out on the newswires with a SEO optimized, expertly-written Press Release from Juice Marketing. Every business has a website, but not every website is created equal. Here at Juice Marketing, we know what makes a website click. Whether you need fresh content for your site, a website SEO audit to improve search visibility, or a website makeover / redesign, we can help. Equation Technologies – San Diego based Equation Technologies turned to the content development experts at Juice Marketing to write and optimize content for their new microsite www.SageIntegrations.com – a website entirely focused on Sage 300 ERP (Accpac) integration with a variety of third party products like ADP, Magento, Aloha POS, Avalara, and more. Mark thank you for sharing all of these success stories highlighting the various services you offer. As a client of Juice Marketing or as I like to consider our relationship “a professional services relationship”, I can’t say enough good things about what we have accomplished with your assistance. Thank you.